The biggest factor in the experience for a tablet is going to be the operating system. It is the basis for the whole experience including the interface gestures, application support and even what features a device can actually support. In particular, selecting a tablet with a specific operating system will essentially tie you to that platform just as if you selected a Windows or Mac based PC but even that is more flexible than tablets currently are. 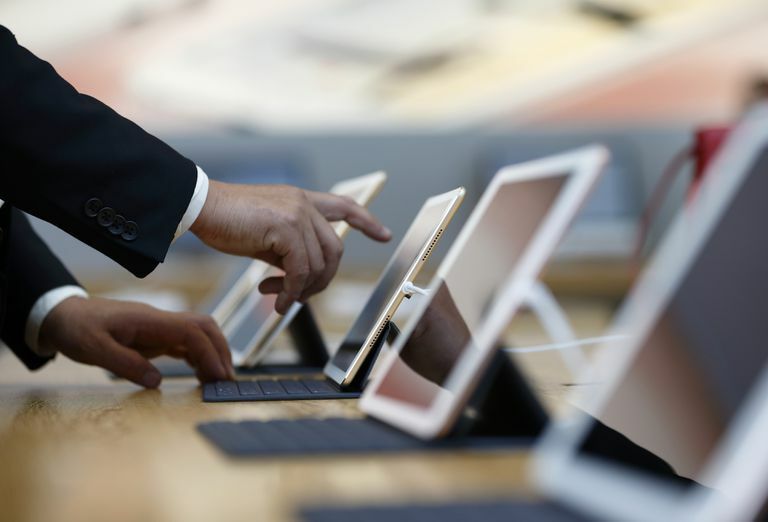 There are three major operating systems that are available now for tablet PCs. Each of them has their own strength and weaknesses. Below, I will touch on each of them and why you may want to choose or avoid them. Apple iOS - Many people will say that the iPad is a glorified iPhone. In some ways they are right. The operating system is essentially the same between them. This has the advantage of making it one of the easiest of the tablets to pick up and use. Apple has done a superb job of creating a minimalist interface that is quick and easy to use. Since it has been on the market the longest, it also has the greatest number of applications available for it through their Apps Store. The downside is that you are locked into Apple's limited functionality. This includes limited multitasking and the ability to only load Apple-approved applications unless you jailbreak your device which has other complications. Google Android - Google's operating system is probably the most complex of the options currently available. This has to do with the fragmentation of the operating system between the 2.x versions designed for smartphones to the tablet-specific 3.x versions. Newer versions of Android have been released and corrects or updates issues and capabilities along the way. The downside to the openness leads to security issues and interfaces that are not as standardized as some of the other operating systems. Android is also the basis for many other tablet companies devices such as the Amazon Fire but they are heavily modified such that they are not as open as the standard Android versions. Many tablet manufacturers also put skins which are a modified version of the user interface on their devices which means that even two tablets running the same version of Android may look and feel very different. Microsoft Windows - The company that dominates the personal computer market has been struggling to get into the tablet market. Their first attempt was with Windows 8 but that had some serious flaws due to a segmented Surface lineup. Thankfully they have dropped the RT product lineup instead focusing on making an operating system that works both with traditional PCs and with tablets. Windows 10 was released and was primarily on desktop computers but it also made it into many tablet products. What Microsoft did with the operating system is put in a Tablet Mode that is optimized for smaller devices with touchscreens. This can be enabled on desktop and laptop computers as well. This means all of the same software you use on your PC can also be used on your tablet. Application stores are the primary means that consumers will be acquiring and even installing software onto their tablets. This is something that should be considered before buying a tablet as the experience and software available to each have very specific implications. In most cases, the application store for the device will be operated by the company that developed the operating system for the tablet. There are a couple of exceptions to this. Those using an Android-based device will have the choice of multiple application stores to use. There is the standard Google Play that is operated by Google. In addition to this, there are various application stores run by third parties including Amazon's Appstore for Android which also doubles as the only storage option for the Amazon Fire tablets, various stores run by the hardware manufacturers of the devices and even third-party stores. This is great for opening up competition in terms of pricing for applications but it can make it more difficult to find applications and raises security concerns if you are not sure who is actually managing the store you buy an app from. Due to security concerns, Google is looking to potentially restrict newer Android OS versions to only the Google Play store. Even Microsoft has gotten into the application store business with its Microsoft Apps on Windows Store. Note that, with the Windows 8 operating system, only applications that fully supported the new Modern UI could be used on both traditional PCs and the Windows RT-based tablets. With Windows 10, however, users have even greater flexibility in terms of installing applications from just about any source. With some tablets, it is still primarily through digital downloads. In each of the different operating systems, there will be links or icons to the default application store. With the development of the application stores, it has become extremely easy for developers to release their applications to the various tablet devices. This means that there are a large number of applications available on each of the different platforms. Now some platforms such as the Apple iOS store have a larger number because the tablet has been on the market longer while others are just getting off the ground. Because of this, Apple's iPad tends to get various applications first and some of them have not migrated to the other platforms yet. The downside to a large number of applications available and the ease with which they can be published is the quality of the apps. For example, there are thousands of list applications available for the iPad. This makes sorting through the available options for which is the best quite difficult. Ratings and reviews on the stores and third party sites can help ease this but frankly, it can be a major pain to find even basic applications on Apple's store. Thus, a device with fewer applications can also have some advantages. The other problem is the quality of many of these applications. Pricing of applications can be very inexpensive or even free. Of course, just because something is free or even $.99 does not mean that it is well made. Many of the programs have very limited features or are not updated to correct problems with new operating system updates. Most free applications are also ad driven that will have various levels of ads displayed to the user while they are in the applications. Finally, many of the free apps may offer extremely limited use of the features unless you pay to unlock them. This is essentially akin to trialware of old. It has recently come to light that companies like Apple and Google are now courting select application developers to produce exclusive releases. In essence, the companies are offering incentives for the developers so that the apps will either be completely exclusive or more frequently released first for their platform for a set time frame before it can be released to others. This is similar to what some console companies are doing with exclusive games for their game consoles. Another thing that may be an issue for families that share a tablet is parental controls. This is a feature that is finally starting to get more support from the major companies. There are several levels of parental controls. The first is profiles. A profile allows a tablet to be set up so that when someone uses the device, they are only allowed access to applications and media that they have been granted access to. This is typically done through media and application rating levels. Profile support is something that Amazon does well with its Kindle Fire and is now becoming a standard feature for the basic Android 4.3 and later OS. The next level of controls is restrictions. This is typically some form of settings within the tablet operating system that can lock out functions unless a password or pin is entered into the tablet. This can include the restriction of specific rated movies and TV or and be the restriction to a function such as in-app purchases. Anyone that has a tablet shared between family members will definitely want to take the time to set up these features which should be available in all of the tablet operating systems at this point. Finally, there is a new feature called Family Sharing on iOS. This allows applications, data and media files purchased through the Apple iTunes store to be shared between family members. In addition to this, it can be set up so that children can request purchases that can then be approved or denied by a parent or guardian to have better control of what children can have access to on their tablets.